To build a list of genes with definitive ties to autism — 65 and counting — researchers look for mutations that crop up in children with autism but not their unaffected parents and siblings. But these rare, harmful mutations are just one piece of autism’s complex genetic puzzle. They don’t explain, for instance, why autism runs in families, or why two people with the same mutation can have vastly different characteristics. 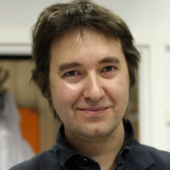 Thomas Bourgeron, professor of genetics at the Institut Pasteur in Paris, is among a group of researchers taking a second look at people who carry a harmful mutation in a known autism gene. Scientists often exclude these individuals from studies under the assumption that the genetic cause of their autism has already been identified, he says. Bourgeron says scouring their genomes may reveal additional mutations or ‘second hits’ that help to explain how autism is inherited and why it is so diverse. We asked Bourgeron how painting a more detailed picture of autism’s genetic landscape will help to advance the field. Spectrum: Why should scientists look for additional mutations in people with autism who already have a genetic hit? Thomas Bourgeron: Our genetic risk is just like a painting that is made up of small dots. Take out one dot and not much changes, but all these dots together make a meaningful painting. The autism field has progressed so rapidly; it’s really amazing. But most of the time we have one column attached to genetic information that says whether or not an individual has autism: yes or no. And sometimes, when we’re lucky, we have the intelligence quotient (IQ). But behind these columns, there is a person. If we only consider that one column — autism: yes or no — it’s easy to say that we found the mutation that caused that autism. But people with autism may have epilepsy, yes or no; sleep problems, yes or no; gastrointestinal problems, yes or no. Autism itself is not yes or no. Some children with SHANK3 mutations are severely affected and can barely speak, and some are going to college. Can additional genetic hits explain this genetic diversity? S: Is the field embracing this complexity in autism? Most of my monogenic friends are clinicians who have a patient in front of them and want to be sure and robust when they talk about genetic risk. My polygenic friends don’t care about these rare mutations because they do not explain why autism runs in families. These spontaneous, or de novo, variants do not explain the heritability of autism. Studies have shown that the risk of developing autism is inherited, so where is that heritability coming from? The full answer to autism’s genetic puzzle lies in the fact that there are millions of genetic variants. We need to think of the genome as a diverse landscape and look at every genetic variant, whether it has big or small effects. Common variants, the ones that are frequent in the population, add up to weight, height, IQ and quantitative traits such as brain volume. They also play a huge role in autism. But they do so collectively, not individually. And, to date, for autism we don’t know where they are or how to measure their effects. S: Is there a danger in talking about ‘autism genes,’ because the term implies clinicians should look no further than a single gene? I then decided that I’m only going to work on these ‘excluded’ families. I’ve now sequenced the entire genomes of about 20 of them. Some of them have a big hit, such as a mutation in SHANK3. But I think it’s important to say, “OK, we have SHANK3, but is there something else?” If you don’t look, you will not find it. S: What are you finding? TB: This project is in progress, but we do find other mutations. 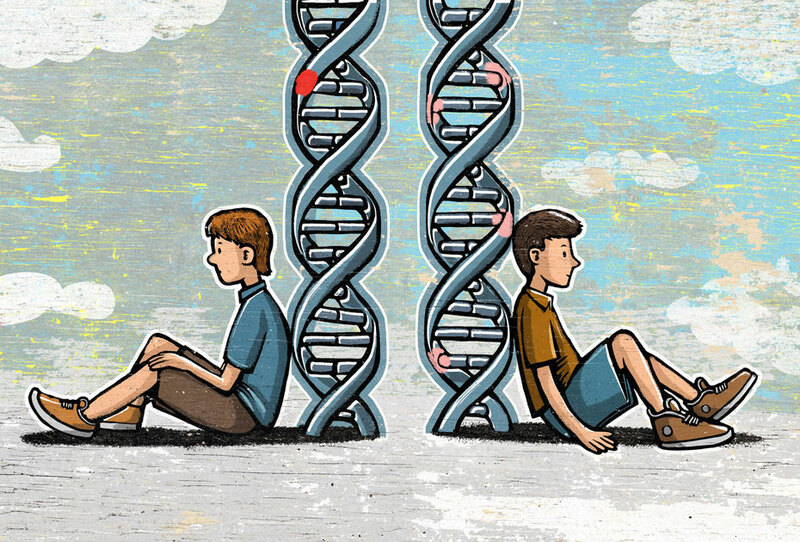 Even in families that have two kids with autism, sometimes one sibling will have a clinically relevant, likely gene-disrupting mutation. But his brother, who also has autism, carries a completely different mutation. Our results replicate those from another whole-genome sequence analysis of siblings with autism published last year. S: Could additional genetic hits counter the effects of a known autism mutation? The more we sequence these ‘controls,’ the more we see people who have a mutation so strong that we’d assume it was the cause of their autism if they had it. But they don’t. Why can people cope with very strong deleterious mutations? My theory is that some mutations are okay in some genomes, or environments, but not others. Imagine throwing a cigarette in the hills in L.A. in August. The chance that it will start a fire is quite high. Take the same cigarette and drop it in Seattle in November and probably nothing will happen. The cigarette is the mutation, and some genomes are protected. Now that we know the strongest autism risk genes, it’s time to look at them across the general population. The first step is to identify everyone in autism and control databases who carries a strong mutation, but who is the unaffected father, mother or sibling of someone with autism. It could seem like a problem for the field if people who don’t have autism carry the mutation. But instead of seeing this as problem, I see this as an opportunity. As always, Dr. Bourgeron’s clear thinking is a guiding light for research. There are reasons for phenotype variability and hunting for multiple hits is an important step towards explaining these differences. Thomas’ points about multiple hits and resilience are good ones. It strikes me that working out why somebody has autism by genetics alone will never be feasible for a large segment of the population because of the complexity of genetic interactions which the interview above alludes to and the huge variation and significance of environmental factors which in my opinion are generally underestimated. One approach on this is to try to assess the affect of every single gene and environmental factor that goes into a human being in a massive matrix which while theoretically interesting probably would not be feasible in any real world sense. Based on this, one could categorize those with autism by various biochemical characteristics Some of these biochemical abnormalities are likely to be critical to etiology as very common biochemical characteristics of autism such as oxidative stress or sulfation deficits are likely to be persistent across more of those with autism than any singe gene defect. Once assessments of biochemistry have been made, take a set with autism with a certain biochemical characteristic and try a certain therapy. For example take those with oxidative stress based on some measure in blood such as 8-OHdG and partition into groups and give one group a carotenoid supplement, give another group benfotiamine, and have the third group be controls. Then analyze biochemistry and behavioral changes in the groups. What therapy works and what does not? I would suggest that this will quickly get us on the road to meaningful therapeutics. Thomas Bourgeron is brilliant. His insights into background genes interacting with apparent primary risk genes is leading the field to a broader understanding the genetics of autism. The simple example of resilience that he presents, a lit cigarette igniting a forest fire in arid Los Angeles but not in rainy Seattle, is highly illustrative. The concept of protective and susceptibility genes, which differentially modify phenotypic outcome in individuals with the same mutation, extends to many human diseases, and can be interrogated with mouse models. Hi! Couldn’t think of a more relevant time to say hello. Our road to finding what we can about our son’s autism through the research community started with a phone call from you about Shank 3. After many years, the obvious question concerning Autism Research is finally being brought up-How can we look at twin studies and say “Autism is a highly penetrant heritable disease” and then use the bar of a de novo mutation to establish whether the variant is causative in an individual’s Autism. It is ironic that I am responding to this on Spectrum considering a story about my son was published by Spectrum which relied heavily on the fact that the otherwise believed significant variant was present in his mother’s DNA, concluding the variant was not causative. Meanwhile I continue to consider him the poster child for the multi hit model as he has another believed mutation on the other shank 3 allele, as do I, and a another mutation on cntnap2. At that time, only 5 genes were sequenced and an astonishing 3 hits found. We are now trying to get full exomic sequencing done. We have waited for the Science to start taking the multi hit model seriously-to do so. As always, thanks for the research to both you and Thomas Bourgeron. “In addition there are a number of biochemical abnormalities that are present in a large portion of those with autism. ” – Exactly! How can you attribute autism to a genetics malfunction when the problem we have has quadrupled in a short course of time? Surely it cannot just be genetics. Something is happening to our young children that messes with their bodies during crucial development. What is it? What are we doing in our environment or poor eating habits and suppressed immune systems that makes these seemingly normal cells turn evil and damage a person for life? Could it possibly be the large cocktail of foreign particles we administer to young children who cannot speak and tell us we are burning them – hurting them with these experimental cocktails. It is not just a genetics thing. I believe the answer is staring us right in the face and we ignore it because the powers that be do not want you to research in a “certain direction” that is not in line with their agenda.